If you are faced with the death of an infant or small child, purchasing a baby casket is the first step in the long and painful healing process. It is true there is no greater loss than the death of a baby or child and making his or her final arrangements can be almost as painful as the loss itself. But if you find a trusted funeral home and director, you will be able to select the casket you want with all of the support you need. Baby coffins are used to bury infants or small children either in the ground, in a burial vault or at times, cremated along with the body. This is the child's final resting place and great care is needed in choosing the correct one. Standard infant caskets start at 17 inches, although some specialty shops and funeral homes make them even smaller. They are made from a variety of materials including wood and metal or a more natural component commonly found in green burials. Memorials.com features over 100 casket options including cremation caskets and casket vaults along with matching caskets for twins in a variety of sizes, colors, and materials. They offer free ground shipping anywhere inside the contiguous U.S. 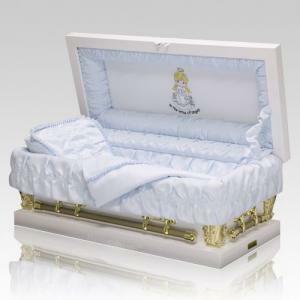 Affordable Funeral Supply sells a variety of infant caskets starting at just under $50 up to over $800. Interior options include plush, lambskin, and crepe. Caskets can be shipped in the U.S. and internationally. Mainly Urns and Memorials carries nearly 150 casket options for infants and children. Their "Design Your Own" line lets you choose the colors, materials, hardware, and embroidered panel. Smaller babies, such as those born prematurely or who died before birth, can rest comfortably in caskets sized for them. Options usually include 10-inch, 14-inch, or 15-inch lengths. Heaven's Gain Ministries offers a selection of caskets designed specifically for first, second, or third trimester miscarriages that are as small as ten inches long. The Serenity Casket Vault by Trigard comes in an 18-inch preemie size in your choice of pure white, white marble, pink swirl, or blue swirl. Each casket comes with a comfort teddy bear. Heartfelt Ltd. Burial carries a Stillborn Burial Cradle designed to look like a handmade wooden baby cradle. You choose the exterior stain color an interior embellishments on this sweet casket. Funeral homes are not allowed to charge a handling fee if a casket is purchased elsewhere. They cannot refuse or ask for a receipt if a casket is purchased elsewhere. A disclaimer or waiver must be signed by the family. Funeral directors and personnel may not slander the company from where your casket was purchased. Many times, you will only have a day or two to select a baby coffin. Because of the emotions involved in the entire funeral planning process, you may not remember everything you normally would when selecting a casket. If that is the case, you may want to take a family member or close friend along to help you with the selection and with any contracts that may need to be signed. If you are purchasing a casket ahead of time for a child who is terminally ill, the entire process may be a bit simpler. If this the case, write down any questions or concerns you may think of before you go to the funeral home. 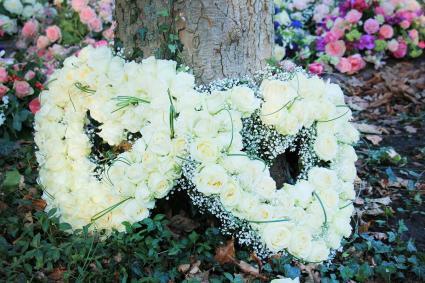 White is the universal color of innocence, so baby funeral flowers typically come in shades of white. It is also appropriate to include pale pink flowers for a baby girl or pale blue flowers for a baby boy. Losing a baby is the worst thing a parent can ever experience. If the burden of grief can be lessened by being knowledgeable about your casket purchase, then your road to healing will be that much smoother.